Win Planet Earth II on 4K UHD HDR Blu-ray! | What Hi-Fi? 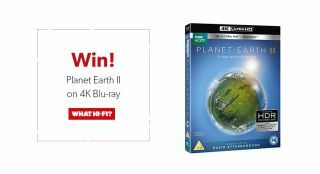 Win Planet Earth II on 4K UHD HDR Blu-ray! We have four copies of The Greatest 4K UHD HDR Blu-ray Yet Released to give away. If you've read our review of the BBC's stunning Planet Earth II on 4K UHD Blu-ray (and if not, why not? ), you'll know we think it's the best reason yet to buy yourself a 4K Blu-ray player. But even though it makes a strong argument, winning a free copy is an even more compelling reason. So for your chance to win one of four copies, just answer this question and keep your fingers crossed. The closing date for entries is 5pm on Friday 31st March.